I contacted T-Mobile's SIM card in Poland, which is 25 PLN (5 PLN sign-up fee and 20 PLN top-up which is valid for 30 days). It includes 10 GB data package. Now, I would like to check how much data remain available right now. 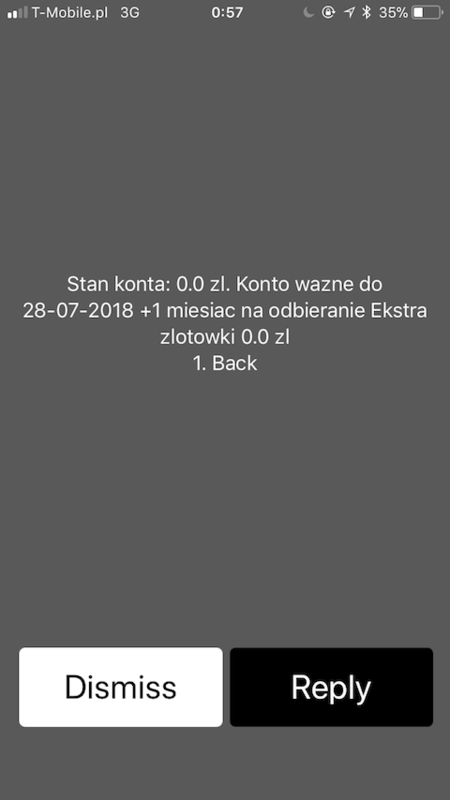 I send *101# but it seems to show only the balance in terms of deposit money (which is 0 PLN in my case), and doesn't show how much data is left in my account available. I don't read Polish so it might be wrong, though. So is it possible to check the balance on data? You can also download their free "Mój T-mobile" app which shows all of this info in a nice way. Not the answer you're looking for? Browse other questions tagged cellphones poland or ask your own question. iPad, cellular data sim card, London UK? How can I check out the balance on my Vodafone Italy SIM card without a mobile app?